Protesting farmers urged Wallonia's legislators to vote against Canada's trade deal with Europe. Agriculture featured prominently in Thursday's declaration to save the deal. But did Belgium really have a legitimate beef? Protesting farmers urged Wallonia's legislators to vote against Canada's trade deal with Europe. 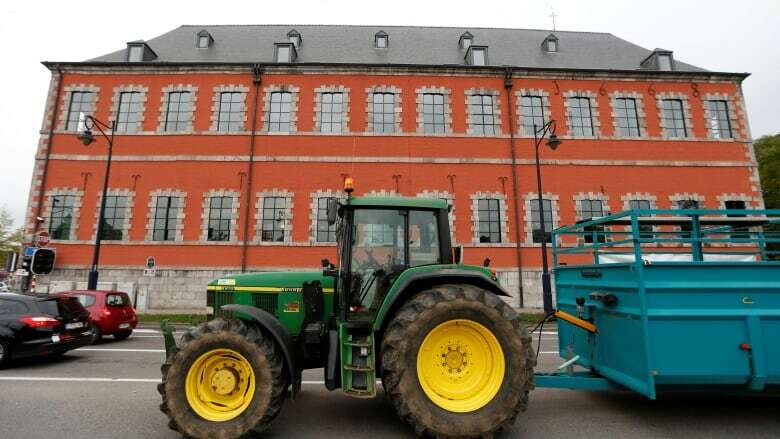 Tractors were parked outside the regional legislature in Namur, Belgium, the day the no votes were cast. Then came Thursday's declaration to save the deal. Again, a nod to the grumpy farmers. "Safeguards" would be provided, it said, if an as yet undefined "market imbalance" emerged as a result of Canadian imports. But do Belgium's livestock farmers really have a legitimate beef? What's in the declarations that sealed the Canada-EU trade deal? 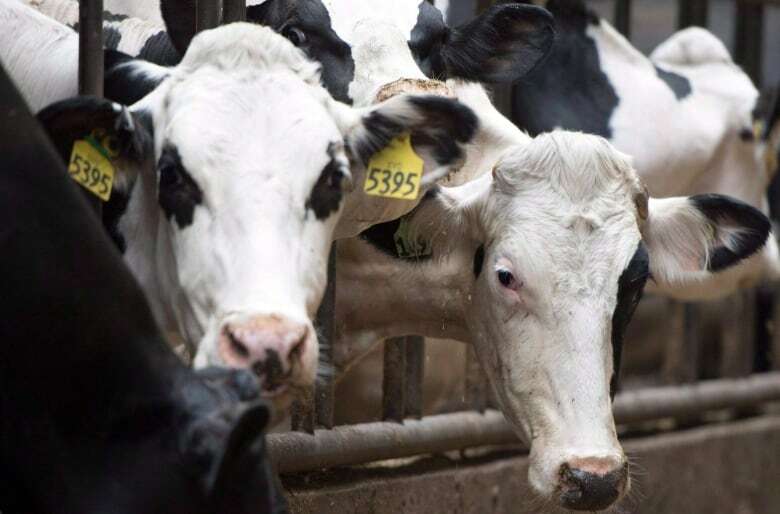 "There's absolutely no way I think that we could ever affect either the price or the quantity over there," said Ron Davidson, the director for international trade, government and media relations at the Canadian Meat Council. Canadian meat products have been all but shut out of the European marketplace for several decades now, thanks to the common market's strategy of looking after its own. It's true that the Comprehensive Economic and Trade Agreement, called CETA for short, secured market access gains for Canadian beef and pork. This win for Canada's export-oriented agriculture sector was heralded as one of the deal's triumphs by the previous Conservative government. Over six years, Canada's annual quota for beef shipped to Europe will rise gradually from 15,000 tonnes to 65,000 tonnes annually. For pork, the quota rises from 6,000 to 75,000 tonnes, again with a six-year phase-in period. But annual consumption of beef across the European Union is over seven million tonnes. Canada's new share, eventually, is less than one per cent of that. For pork it's even smaller: less than 0.4 per cent of total European consumption. "It just doesn't make any sense to me how it could possibly be an issue for the European market," Davidson said. Additionally — and here's the kicker, as Davidson sees it — European livestock producers who want to export to Canada have tariff-free, quota-free market access from Day 1. "It's not balanced," he said. "I find it quite amazing that they're complaining about it." Protesting farmers in Wallonia said their average farm size was about 50 hectares, while in Canada it's over 300 hectares. Outside of the supply-managed dairy, egg and poultry sectors, Canadian agriculture is more focused on expanding abroad. But Walloons have nothing to fear, he said. "If they're producing a lot of domestic product there, there's not going to be a domestic demand for it," he said, suggesting Canadian beef or pork would end up in parts of Europe without a strong domestic industry, or as premium products in high-end restaurants. "They're not even going to know it's coming in, it's so small," he said. The sign of an effective protest can be the degree to which it gets results. On Thursday, a section in the final declaration written by Belgium's government leaders provided for unspecified "safeguards" that would be applied to ensure Belgium's agriculture sector does not suffer from some kind of as yet undefined "market imbalance" as a result of Canadian imports. But Canada did not agree to renegotiate CETA's market access quotas. So what are they talking about here? Canadian agriculture officials have speculated this may be code for compensation — something in the works here in Canada too for the dairy industry, as it concedes two per cent of Canada's domestic cheese market to new European imports. An announcement on the details of that for farmers and dairy processors is expected to quickly follow the CETA signing, perhaps as early as next week. The declaration also specified that existing regulations will continue to apply for things like genetically modified organisms (GMO foods), including the EU's precautionary principle, which says that if something can't be proven safe, it won't be allowed. Certain crops common in North America may not be allowed in the European Union. The Belgium declaration also touched on "geographic indicators" — like the name Feta, which is meant to apply only to cheese from Greece. Faced with concerns from several countries, Greece included, the European Commission had already issued a seven-part declaration on this issue, clarifying how regional trademarks were protected and enforced. Then there's the food safety debate. Was Canada applying pressure to lift beef hormone restrictions? "We didn't even ask for it," Davidson said. "So the fact that they were talking about that shows to me, my gosh, they don't know the terms of their agreement, how good a deal they have." "Every time you read something you're going to hear them saying they have safer product than we do. The reverse is true," he said. Davidson cites an example of veterinary drugs approved for veal calves. At least 83 approved in Europe, he said, are prohibited by Health Canada because of fears about antibiotic-resistant microbes. "Contrary to what you're hearing they don't have safer meat," he said. Canada does some things differently. What he calls a "long, slow, drawn-out process" to work out equivalent regulations continues for things like the Canadian use of carcass washes to reduce E. coli contamination. Even if current Canadian herd sizes could provide the new volumes — which they can't, yet — these talks haven't finished in time for the provisional application of CETA. "For us, the negotiations aren't over," he said. Without a resolution, "we are not going to be able to take advantage of the beef [deal] six months from now. It's just not in the cards."